DOT Copper Eyelets, Eyelet Distributor, Brass Inserts - Bolt Products - Bolt Products Inc.
Bolt Products Inc. is a authorized DOT distributor, carrying a wide selection of copper eyelets, brass inserts and blind rivet nuts. When it comes to reducing eyeletting costs, nobody compares with DOT. After all, DOT has had more than 100 years to perfect our art! Over the decades,DOT has developed ways to lower both fastener costs and installation costs, while still offering a broad selection of quality copper eyelets and standard inserts. DOT eyelets are more economical than other types of industrial fasteners such as tubular rivets, semitubular rivets, etc. Our eyelets are neat and attractive and, to ensure strength, uniform in size with closely-held tolerances. To further reduce costs, our copper eyelets can be quickly and easily set with attaching equipment. Our versatile, efficient equipment is ideal for high-speed, high-volume production, as well as low-volume operations. Available in a variety of materials, styles and finishes in 60 standard sizes, DOT copper eyelets let you lower costs without sacrificing quality or selection. 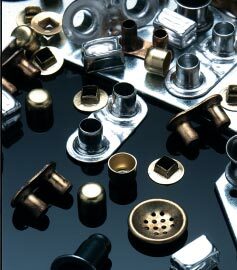 We also provide specialty eyelets and grommets as well as tools to meet customer specification.